What is the Shimano S-Concept? Introduction: Sometimes when manufacturers release new promotions it is hard to distinguish what is truly innovation, and what is just marketing hoopla. What sounds like the ultimate solution can turn out to be no more then just swanky advertising. We take a look at Shimano�s new �S-Concept� to distinguish if this new conception is just more of the same, or something to really get excited about. What is S-Concept? Shimano S-Concept stands for "Smooth, Silent, and Strong" operation in their new family of reels. This represents the "initial philosophy" on which the newer Shimano reels were designed. 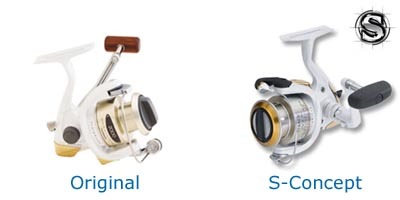 This year there are three reel families which take advantage of the new S-Concept design, the Stella FA, Sustain FD, and Stradic FH. S-Concept reels have new dimensions, new spools, and a wealth of upgraded features that set them apart from the previous generation models. We take a look at the Stradic FH to provide a snapshot of what the new S-Concept really means for anglers. 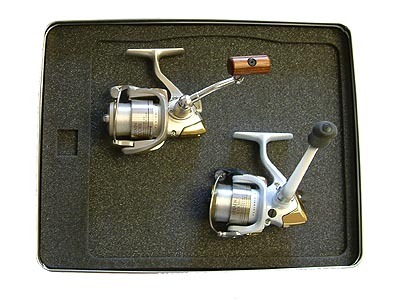 Side by Side: When you put the new Stradic side by side with its previous generation model you immediately will notice two things, the new sleeker design, and the reduced overall weight of the reel. We found the Stradic to be so sleek and elegant in design that we laid it side by side the Sustain 1000FB and still found many elements of the new StradicFD that made it superior to the old Sustain! While going through all the comparisons we noted that the new S-Concept reels now have many of the same features that many anglers love about the older Daiwa offerings. These include a breakaway handle, enlarged spool, and super-sized drag. Also interesting to note is that the new lightweight Stradic MgF is not part of the S-Concept family and is built much more similarly to the previous generation model. Smooth (operation): The previous Stradic models were famous for being silky smooth, but after a few minutes of reeling the new Stradic FH the old models simply felt unrefined in comparison. 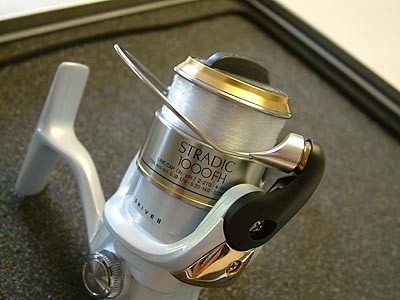 The new Stradic FH is amazingly smooth and is comparable to reels previously costing twice as much! How is it that Shimano can make a reel with the same number of bearings operate so much smoother? The answer is in the very guts of the reel. The Stradic FH makes use of the same Fluidrive II large bore master gear, which makes winding smooth and effortless, and adds in new stainless steel ball bearings which are treated with a special coating making them more durable and causing them to stay smoother and rounder much longer. In addition these bearings are a real benefit for saltwater anglers as the treatment drastically improves corrosion resistance. Shimano states that these new "A-RB" (Anti-Rust bearings) will last at least 10 times longer then conventional bearings in high salinity environments. Smooth (casts): When you cast the new S-Concept reels you will also notice a significant gain in casting distance. This is caused by what Shimano calls "super slow oscillation." The oscillation of the spool has been adjusted both through gearing and a wider spool to be less then the previous models. Line is then wound onto the spool slower and in a more even manner. This line management allows the line to flow from the spool in much nicer curls minimizing energy loss, and resulting in longer more accurate casts. Smooth (Drag): One of the main reasons Daiwa spinning reels are a favorite among anglers is due to their excellent drag performance. Well now Shimano S-Concept reels are boasting drags that truly rival Daiwa's latest offerings. Increased drag surface area and a new microclick function allow for the smoothest most accurate fade free drag performance ever exhibited by any Shimano reel. In pressure tests the new drag system in the StradicFH outperformed the previous Stradic and Sustain in both level of adjustment and overall drag pressure! It is important to note that if you are fishing big game or enjoy surf fishing the SustainFD and StellaFA would be better choices as these now include a completely sealed waterproof drag system. Silent: How do you make a quiet reel even more silent? Shimano's answer is to improve the materials and tighten tolerances to a new levels in the S-Concept reels. But the single most important upgrade is the new improved floating shaft which now adopts a bearing to support the spool shaft and physically separate it from the pinion gear, reducing a great deal of friction to allow resistance free rotation, and a ultra silent operation. Anglers know that maintaining your reel is key to ensuring smooth and silent performance, but how many of us actually correctly maintain our reels? 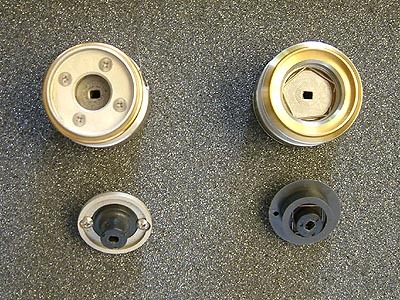 It is fact that the main assembly gears in our reels can only be properly lubricated by opening the main reel housing. 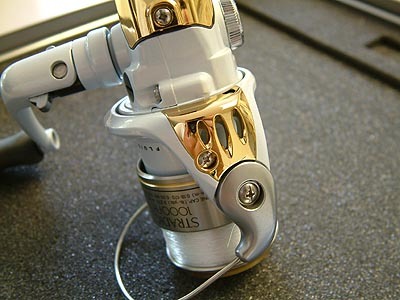 Few anglers will do this themselves due to the complexity of high performance reel design. I personally have taken apart reels for tests and put them back together only to find an extra screw or gasket that I had neglected to put back. To allow any angler to properly maintain the S-Concept reels with ease Shimano introduces their ingenious "maintenance port" which is essentially a removable access screw that allows you to directly oil the inside mechanism without having to take the entire reel apart! 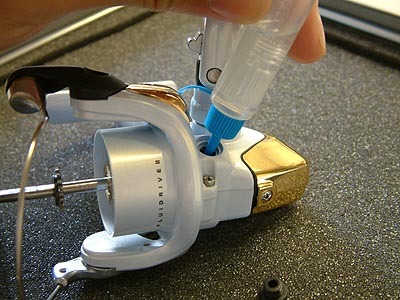 Thus keeping your S-Concept reel smooth and silent long after the initial day of use. One of the most innovative designs we have ever seen in a reel, the new Shimano "maintenance port"
Strong: New hardened pinion gears are more then twice as strong as previous reels and have a much lower wear rate resulting in superior torque the day you buy the reel, and the same muscular operation a year later. With more durable gears, bearings, forged aluminum spools, and a reinforced aluminum body, the new S-Concept reels are the most reliable and durable Shimano reels ever designed. Surprisingly the new reels are more durable and still able to achieve lower total weights then the previous models. We were very pleased to see that Shimano did not sacrifice any durability, line capacity, or refinement when they designed the new longer lasting S-Concept reels. In fact these new reels are simply lighter, extra ergonomic, and more robust then last years offerings. Conclusion: The Shimano S-Concept is not just a fancy new campaign at work, it is in fact the successful efforts of Shimano engineers to design reels that are even more smooth, silent, and strong then their previous premium offerings. These "state-of-the-art" reels not only raise the bar for performance spinning but arm anglers with tackle boasting a new level of refinement, durability, and ease of maintenance. We were very impressed with our initial tests of the StradicFH and will be providing even more in depth field tests and comparisons with competitor offerings shortly.